Well I survived! I made it through my son’s 7th birthday party. My basement didn’t fare as well. It’s amazing how much craziness comes out of eight 7 year old boys who have consumed way too much sugar! 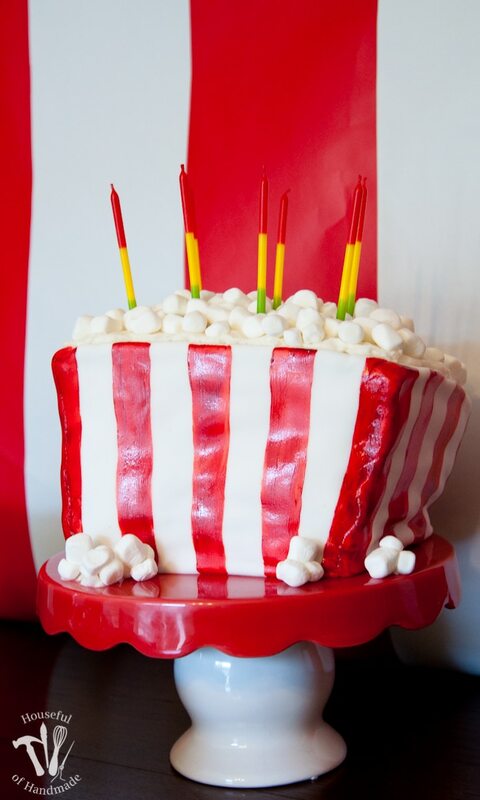 I’m sure it will be much better after a good carpet cleaning, but until then, I am going to to put my feet up and share some Movie Theatre themed birthday fun! Before I dive into all the details of the birthday party, I thought I would start by sharing the cake! It’s actually been a couple years since I made an actual birthday cake, we have been favoring cupcakes lately. But I had this idea and really wanted to give it a go. 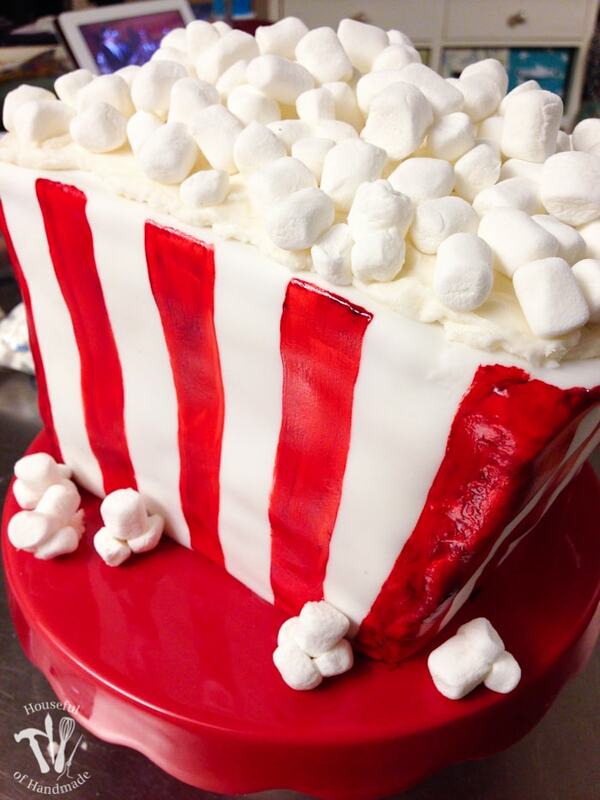 I wanted to make a cake that looked like a giant popcorn container with marshmallows for the popcorn. And I wanted to achieve it with fondant. The problem… I’ve never used fondant before! I’ve observed my very talented sister use fondant many times, so of course I figured I could take it on and the cake turned out okay. Everyone at the party said it looked awesome and my son loved it (which is all that really matters). But if I did it again, I would definitely do things differently. 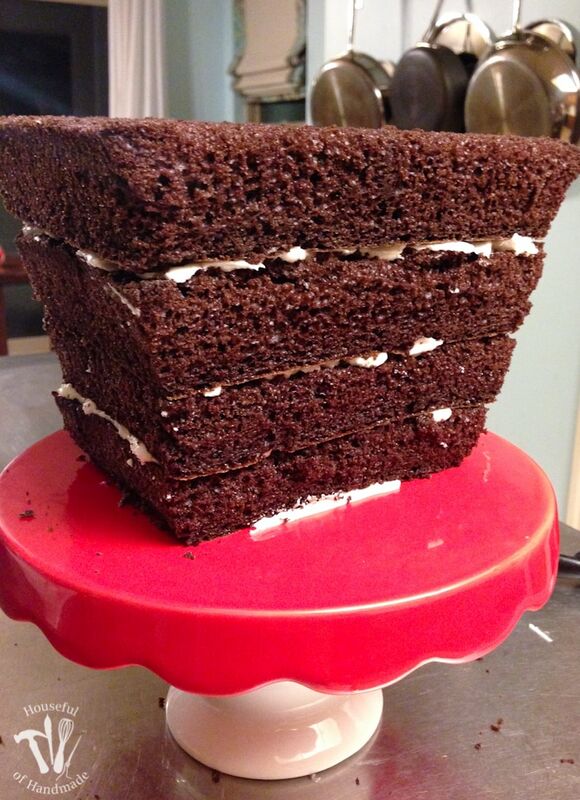 I wanted to make a 4 layer cake to make it nice and tall, but I’m cheap, and that is where my first mistake came in. I thought about buying a 6 inch square cake pan (it was only $7) but I figured I could just make a 9×13 cake and cut it in half and it would be just fine. Then I angled the sides in so they were a little smaller on the bottom to look like a popcorn bucket. And things were going okay, until I tried to frost it. The cut edges of the cake were too soft and the cake just kept falling apart. So I would definitely invest in a cake pan and then the edges of the cake would be sturdy enough to withstand the frosting. The cake would have been much easier if I had just done 4 layers of of cake in a 6 inch square pan. After you get your cake cooked and cooled, you want to put a layer of buttercream frosting on the cake plate below your first layer to help keep if from moving around on you. Then start stacking your layers with a layer of of buttercream frosting between each layer. 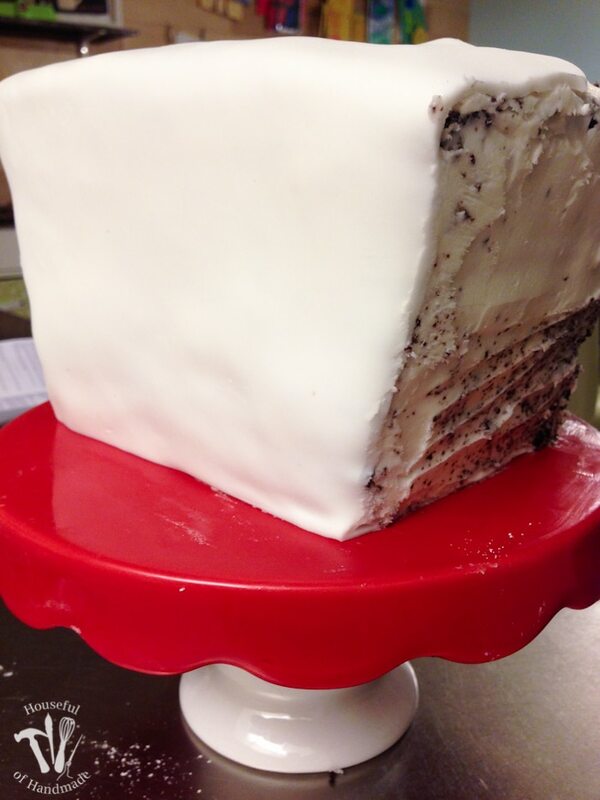 Once all the layers are stacked, frost the outside of the cake with a nice layer of buttercream. It doesn’t have to be totally perfect (you can see mine was very far from perfect). Then it’s time for the fondant. I bought a 24 oz box of white fondant and it was plenty for my cake. 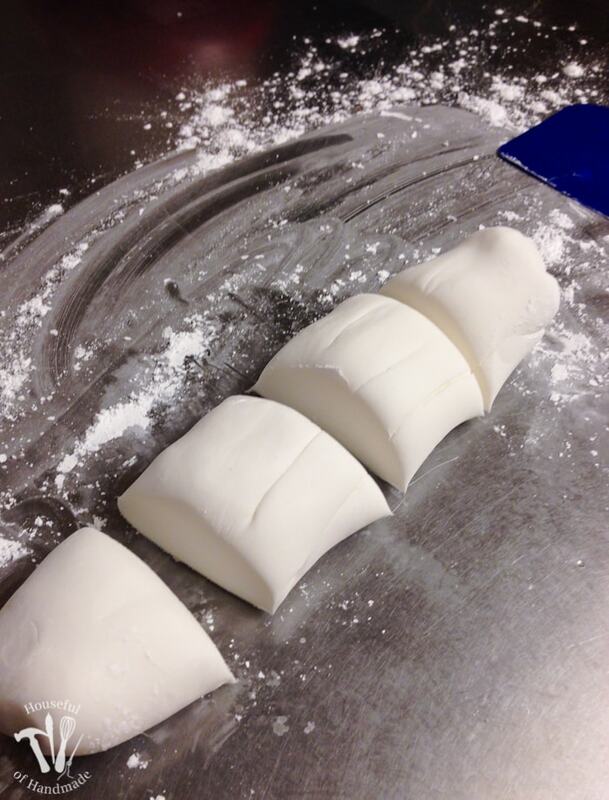 I rolled the fondant into log and then cut it into 4 pieces, one for each side. I decided to not add fondant to the top of the cake, and just put on it each side with a little over the top. If you know how to use fondant, you could probably do it the other way, but this was my cheater way. 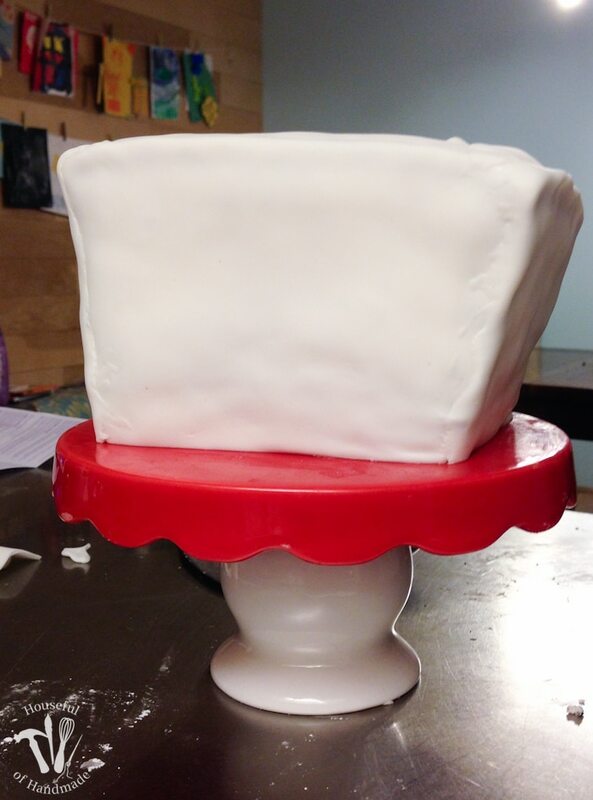 I rolled out each piece of fondant and cut a straight edged on the bottom. Then I lined it up on the side of the cake with the bottom on the cake plate. It stuck nicely to the side of the cake with the buttercream. I cut the excess fondant off the sides of the cake and then repeated on the next side. To seal up the corners, I dipped my finger into a cup of water and rubbed it on the corner then rubbed the fondant smooth with the back of a spoon. Super fancy and it didn’t work perfectly, but it worked good enough for me at 10PM the night before the party. 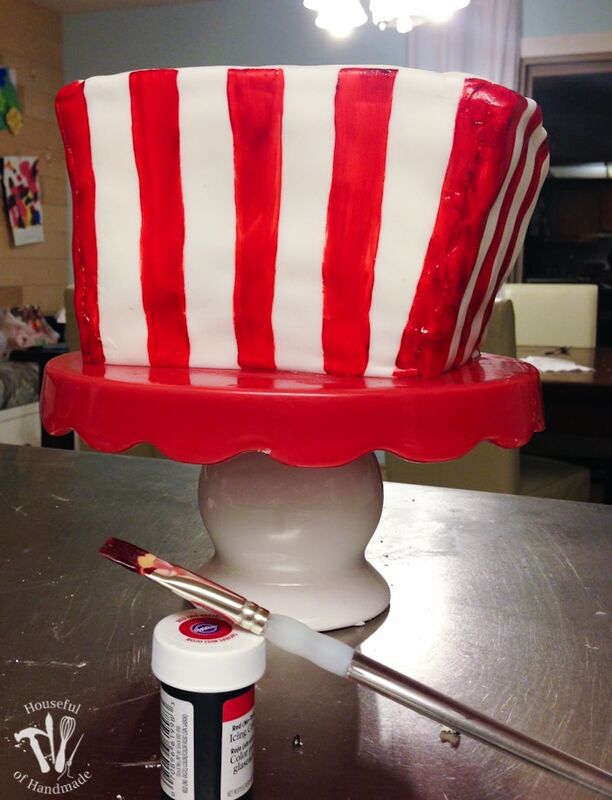 Once the four sides were all covered with fondant, it was time to add stripes. 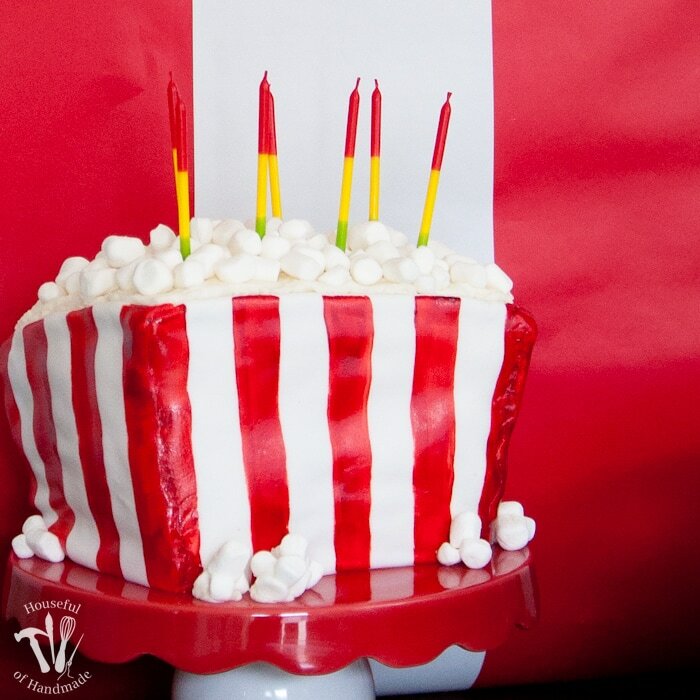 I used a gel food color to paint bright red stripes on the fondant. Then to make the top of the cake look pretty, I covered the top with thick layer of buttercream frosting! You can never have too much buttercream. And then I covered it with a layer of mini marshmallows. 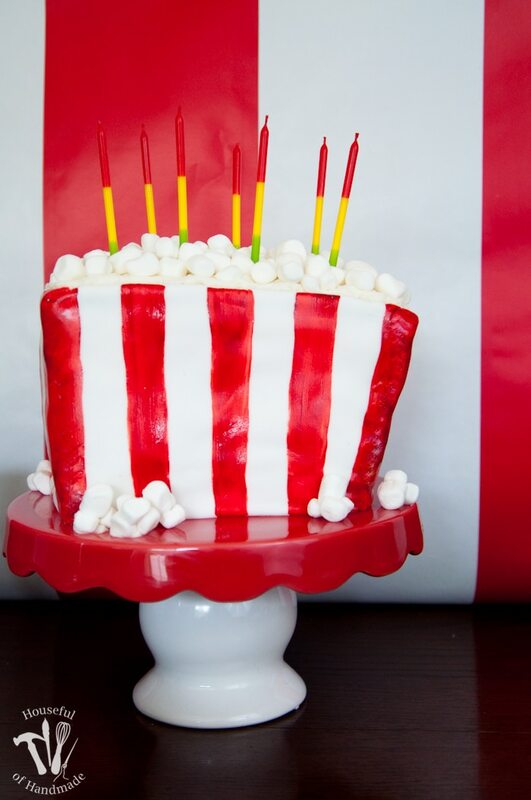 For a few “popcorn” marshmallows to place around the base of the cake, I cut some of the marshmallows in half and stuck 3 halves to the bottom of one marshmallow. The cut side was sticky enough to just stick to the marshmallow without anything. Then I secured them to the cake plate with a dollop of frosting. As I was finishing up the cake and getting ready for bed, I noticed that the back of my cake was starting to squish down. 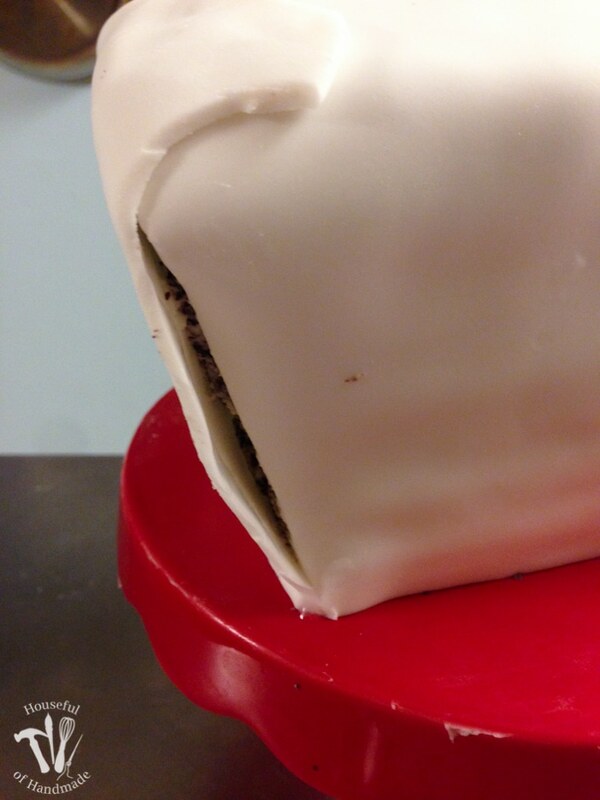 The cut cake was just too soft to hold up to the weight of the cake and frosting. My popcorn bucket was starting to look like a paper bag instead. I was honestly worried that it would just fall apart as I slept, but luckily it was fine until the birthday party or this post would definitely be a DIY fail! But again, I wouldn’t recommend cutting a cake and then stacking it and covering it with fondant. Kati, I love how this turned out! Such a fun cake idea. Pinned and tweeted. Thanks for sharing at Merry Monday, hope to see you again next week! So stinking cute! I bet he loved it!